Philip Adjah brace helps Mohammedan Sporting score CFL comeback win over East Bengal! Home / Indian Football / I-League / Philip Adjah brace helps Mohammedan Sporting score CFL comeback win over East Bengal! Mohammedan Sporting Club buried East Bengal’s title hopes in the ongoing Calcutta Football League – Premier Division ‘A’ following a 2-1 comeback win on Tuesday at the Saltlake Stadium. The Black Panthers scored scored twice late in the second-half through substitute Adjah Philip Tetteh (87′, 90’+4) to make Johnny Acosta’s opener (12′) count little. Mohammedan Sporting began the game in attacking mode and created the first close chance in the first minute itself. Princewill Emeka did well to cut in past a couple of defenders from the left but his powerful drive sailed inches over the horizontal. While East Bengal pressed high up, East Bengal managed to take the lead against the run of the play at the other end. Acosta capitalised on a defensive error to beat Mohammedan Sporting custodian Arup Debnath from close range in the 12th minute. Having conceded early on, Mohammedan Sporting began attacking with intensity through Dipendu Dowary, Rahul KP and Princewill, but East Bengal managed to hold on defending deep as the first-half ended 1-0. The second-half was a similar story as Mohammedan Sporting dominated majority of the proceedings looking for the equaliser and almost camped in the rival half. While they pushed up front, close chances fell for Prosenjit Chakraborty, Laltu Hembram, Princewill and Dipendu but they lacked killer finish in the final third. Technical Director Raghu Nandi brought on Adjah in place of Princewill in the 73rd minute as the Black Panthers made a tactical change looking for the equaliser. Mohammedan Sporting’s persistence finally paid off in the 87th minute when Adjah scored a brilliant solo goal to make it 1-1. Having equalised, Mohammedan Sporting increased their pressure and attacked the rival goal ferociously going close on a few occasions. 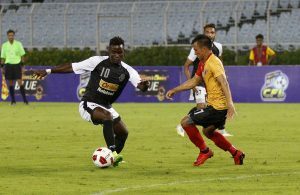 Mohammedan Sporting’s pressure yielded another goal as Adjah scored yet another spectacular goal to ensure full three points for Black Panthers in additional time. The result saw Mohammedan Sporting climbed to the fourth spot on the log standings with 16 points from eight matches and will take on Tollygunge Agragami next on Saturday at Barasat Stadium. Previous AWES Cup: Sporting Clube de Goa beat champions Dempo SC to reach final! Next VIDEO – 442oons: UEFA Nations League – Goggle in the Box (Parody)!